BACKGROUND AND PURPOSE: Hemimegalencephaly is a rare but well-known congenital malformation with ipsilateral enlargement of the hemicerebrum. However, very little is known about changes in structures outside the involved hemisphere in patients with this condition. 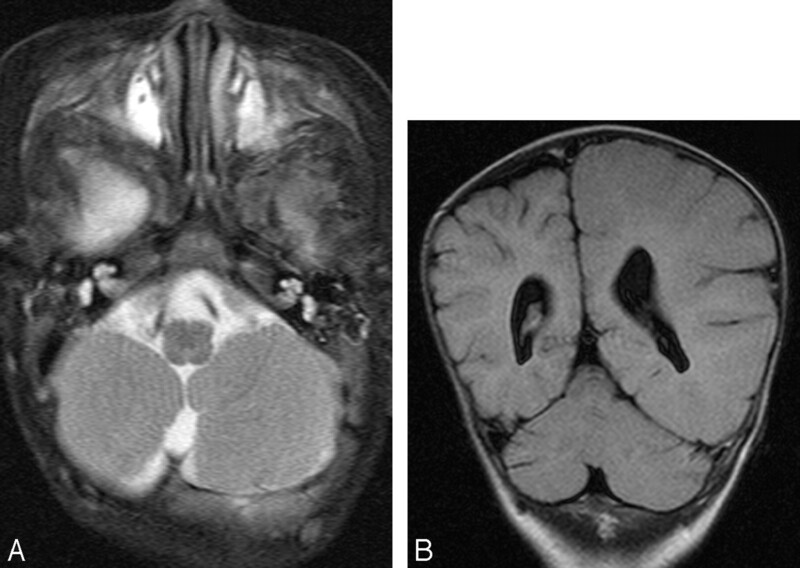 We investigated morphologic abnormalities occurring outside the affected hemisphere by MR imaging in a large series of patients with hemimegalencephaly. MATERIALS AND METHODS: MR imaging findings for 30 patients with hemimegalencephaly were retrospectively reviewed and evaluated for structures outside the involved hemisphere on routine MR images, such as cranial nerves (I, II, V), brain vessels, subdural and subarachnoid spaces, brain stem, and cerebellum, on both the ipsilateral and contralateral sides. RESULTS: The ipsilateral olfactory and optic nerves were enlarged in 8 (26.7%) and 1 (3.3%) of the 30 patients, respectively, without enlargement on the contralateral side. No asymmetry was noted in the trigeminal nerves. Asymmetric vascular dilations in the ipsilateral cerebral hemisphere were observed in 12 of the 30 patients (40%), in deep cerebral vessels in 11 patients (36.7%), and in superficial cerebral vessels in 8 patients (26.7%). Ipsilateral brain stem and hemicerebellar asymmetric enlargement was detected in 2 patients (6.7%) and 14 patients (46.7%), respectively. Abnormal cerebellar folia were observed on the ipsilateral side in 6 patients (20%) and on the contralateral side in 3 patients (10%). CONCLUSION: Ipsilateral olfactory nerve enlargement, cerebral vascular dilations, cerebellar enlargement, and bilateral or ipsilateral abnormal architecture of the cerebellar folia are often associated with hemimegalencephaly. These reported MR imaging findings were mainly noted in the affected hemicerebrum. There are a few case reports that have described cerebellar abnormalities.9,10 However, to our knowledge, no original manuscripts have been published focusing on abnormalities outside the involved hemisphere. We recently noted that some patients with hemimegalencephaly had enlarged olfactory nerves, cerebral vascular dilations, and abnormal architecture of the cerebellar folia. We, therefore, retrospectively reviewed 30 patients with hemimegalencephaly, which, to our knowledge, is the largest number of patients included in any study of hemimegalencephaly, to evaluate structures outside the involved hemisphere on both the ipsilateral and contralateral sides, including the cranial nerves, blood vessels, subdural and subarachnoid spaces, brain stem, and cerebellum. We retrospectively reviewed MR imaging findings for patients with hemimegalencephaly in 2 institutions. There were a total of 30 patients (19 men and 11 women) identified by medical records. All patients were hospitalized for intractable epilepsy between January 1998 and December 2005, and detailed examinations were performed to determine whether surgical treatment was indicated. The diagnosis was made on the basis of both clinical and imaging findings. The standard evaluation included detailed history and neurologic examinations, scalp electroencephalogram recording, technetium/Tc99m-L, L-ethyl cysteinate dimer (ECD) single-photon emission CT (SPECT), and MR imaging studies. In addition, ictal ECD SPECT and cerebral 2-[18F]fluoro-2-deoxy-D-glucose positron-emission CT were performed in 10 patients. Twenty-two patients underwent hemispherectomy, and the results of pathologic examinations were consistent with hemimegalencephaly, with findings such as polymicrogyria, heterotopia, dysplastic neurons, incomplete gyration, and gliosis.2,5 Eight patients did not undergo surgery because it was not expected to be efficacious or because their conditions were controlled with medical treatment. All patients underwent preoperative MR imaging examinations from 1–3 times. We evaluated the images obtained at first MR imaging examination. At that time, patient age ranged from 6 weeks to 19 years of age (mean, 2 years of age). This study had appropriate ethics committee approval. MR images were obtained on a 1T (Magnetom Impact; Siemens, Erlangen, Germany) or 1.5T imager (Signa; GE Healthcare, Milwaukee, Wis). Sequences included T1-weighted images (TR/TE, 300–624/9–15 ms; FOV, 220 × 220 and 220 × 165; section thickness, 4- to 7-/0.5- to 1.7-mm gap; matrix, 256 × 224 and 256 × 256; NEX, 2), T2-weighted images (TR/TE, 4000–4200/95–121 ms; FOV, 220 × 220 and 220 × 165; section thickness, 3-to 6-/0.5- to 1.7-mm gap; matrix, 256 × 224, 256 × 256, and 512 × 448; NEX, 2 or 3), fluid-attenuated inversion recovery (FLAIR) images (TR/TE/TI, 8000–10002/104–158/2200–2500 ms; FOV, 220 × 220; section thickness, 5- to 6-/1- to 2.5-mm gap; matrix, 256 × 192, 256 × 256, and 512 × 432; NEX, 1), inversion-recovery images (TR/TE/TI, 4000–4210/32–85/120–150 ms; FOV, 220 × 220 and 220 × 165; section thickness, 3- to 4-/0.3- to 2-mm gap; matrix, 256 × 256 and 512 × 432; NEX, 2 or 3), and 3D high-resolution sagittal T1-weighted fast low-angle shot (gradient-echo images) (TR/TE/TI, 1970/3.9/110 ms; flip angle, 15°; FOV, 315 × 315; effective section thickness, 1.2 mm; slab thickness, 177 mm; 3D partitions, 144 sections; matrix 512 × 228; NEX, 1). Three different planes were obtained in all MR imaging examinations, except in 3 studies, which included the axial and coronal planes. Each examination included 4–9 sequences. All MR images were evaluated by 2 neuroradiologists (N.S. and H.O., with 19 and 21 years of experience with MR imaging, respectively). Results were determined by consensus of the 2 readers. All serial images obtained for each patient were reviewed at the same time. The structures outside the involved hemisphere were evaluated, including the cranial nerves, subdural and subarachnoid spaces, brain vessels, brain stem, and cerebellum. These findings were reviewed for both ipsilateral and contralateral sides. Asymmetry was one of the key aspects of evaluation. In addition, folia pattern was evaluated in the cerebellum. Because this was a retrospective study based on routine MR images, only large cranial nerves (the olfactory, optic, and trigeminal), which were clearly observed on our routine MR imaging studies, were evaluated. The olfactory nerve was evaluated with coronal images, whereas the optic and trigeminal nerves were evaluated in at least 2 planes: the axial and coronal; axial and sagittal; or axial, coronal, and sagittal planes. The brain stem, cerebellum, and subdural and subarachnoid spaces were evaluated on both axial and coronal images. Vascular dilations were assessed on axial or coronal T2-weighted images. The right cerebral hemisphere was affected in 15 patients, and the left cerebral hemisphere, in 15 patients as well. The olfactory nerve was enlarged ipsilaterally in 8 of the 30 patients (26.7%) (Fig 1), and ipsilateral optic nerve enlargement was noted in 1 patient (3.3%) (Fig 2). None of the abnormally enlarged olfactory or optic nerves were observed on the contralateral side. Trigeminal nerve enlargement was detected on neither side. Asymmetric vascular dilations in the ipsilateral cerebral hemisphere, compared with the contralateral hemisphere, were noted in 12 of the 30 patients (40%). Eleven patients (36.7%) exhibited deep cerebral vascular dilation (subependymal vein or internal cerebral vein) (Figs 3 and 4). Asymmetric dilation of superficial cortical vessels was observed in 8 patients (26.7%) (Figs 1 and 4). No asymmetric vascular dilations were noted in the posterior fossa. No other abnormal findings were detected in the subdural or subarachnoid space, except for an arachnoid cyst in the contralateral middle fossa in 1 patient. Brain stem asymmetry with ipsilateral enlargement was noted in 2 patients (6.7%) (Fig 5), each of whose cerebellum was also asymmetrically enlarged ipsilaterally, indicating total hemimegalencephaly.1,10 Ipsilateral hemicerebellar enlargement was noted in 14 of the 30 patients (46.7%) (Figs 5 and 6). However, an abnormal folia pattern was observed on both sides, ipsilaterally in 6 patients (20%) and contralaterally in 3 patients (10%) (Figs 5 and 7). A 3-month-old boy with right hemimegalencephaly. A and B, Coronal T2-weighted images demonstrate a diffusely enlarged right olfactory nerve from the exit to the distal portion (arrows). The left nerve is not enlarged. B, Superficial cortical veins are asymmetrically dilated on the right (arrowheads). A 7-month-old boy with left hemimegalencephaly. A, Axial FLAIR image shows an asymmetrically enlarged left optic nerve (arrow). B, Coronal T1-weighted image reveals findings similar to those in A (arrow). C, Coronal T2-weighted image reveals asymmetry of the olfactory nerves (arrow), as well, with the left one slightly larger than the right at the exit zone (arrowhead). 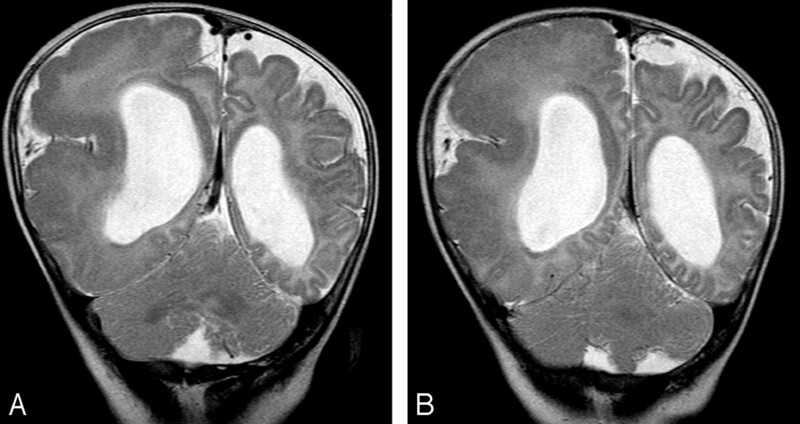 An 8-month-old girl with right hemimegalencephaly. Axial T2-weighted image shows an asymmetrically dilated right internal cerebral vein (arrow). A 4-month-old boy with right hemimegalencephaly. 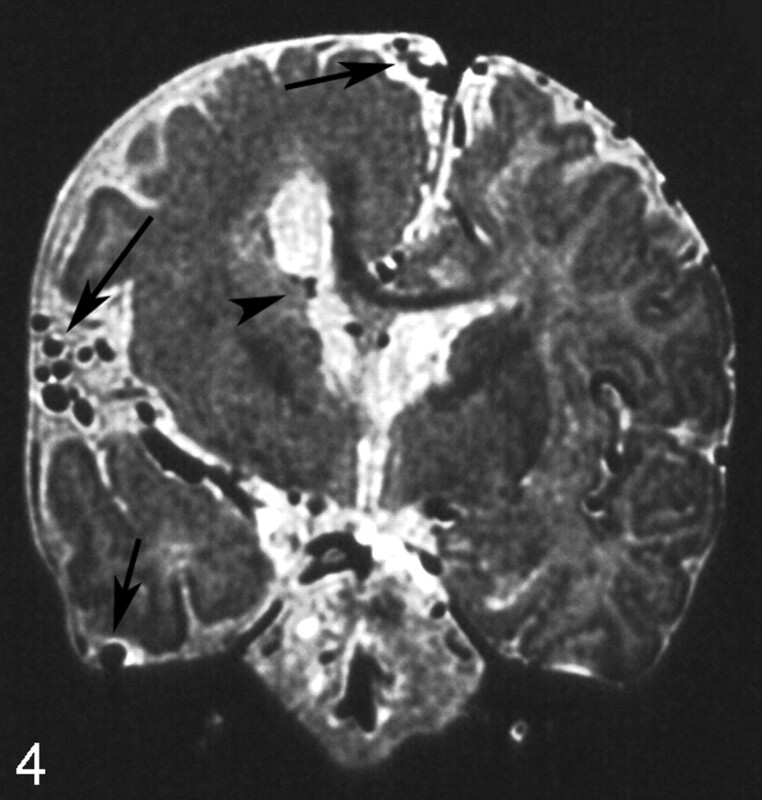 Coronal T2-weighted image shows markedly dilated superficial cerebral cortical vessels (arrows) and subependymal veins (arrowhead) on the ipsilateral side. A 4-month-old girl with right hemimegalencephaly. A, Axial T2-weighted image demonstrates asymmetry of the medulla oblongata and hemicerebellum with abnormal folia. B, Axial T2-weighted image shows asymmetry of the pons and hemicerebellum. C, Axial T2-weighted image also shows an asymmetric midbrain. The findings for this case are compatible with total hemimegalencephaly. A 4-month-old boy with left hemimegalencephaly. 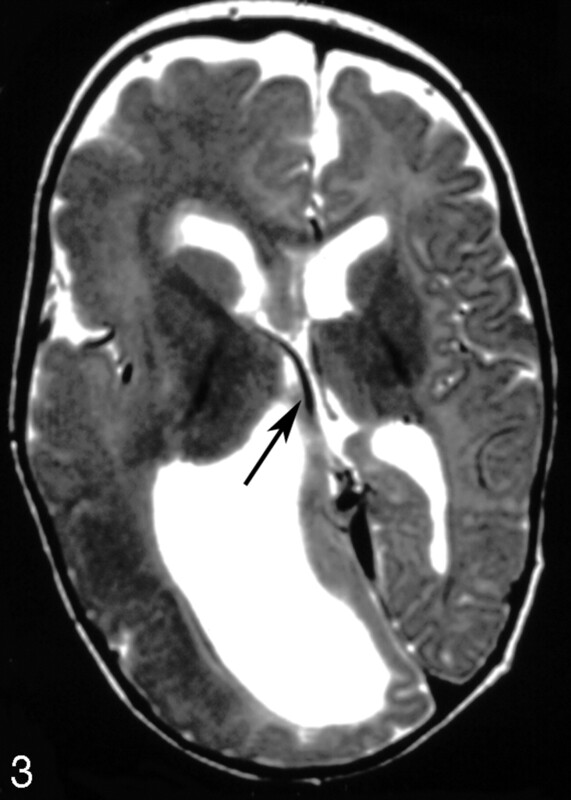 A, Axial T2-weighted image shows an asymmetrically enlarged left hemicerebellum. No asymmetry of the brain stem is noted. B, Coronal FLAIR image also shows asymmetry of both the left hemicerebrum and hemicerebellum. A 6-month-old boy with right hemimegalencephaly. A and B, Coronal T2-weighted images demonstrate abnormal folia in both ipsilateral and contralateral cerebellar hemispheres. We detected various morphologic anomalies outside the involved hemisphere in an examination of the largest number of cases ever included in a study of hemimegalencephaly. To the best of our knowledge, no previous original manuscripts have focused on abnormalities outside the affected hemisphere in patients with hemimegalencephaly. This condition involves not only the cerebral hemisphere but also the cranial nerves, cerebral vessels, and cerebellum. Ipsilateral olfactory nerve enlargement, dilated cerebral vessels, hemicerebellar hypertrophy, and abnormal architecture of the cerebellar folia were often observed, though ipsilateral optic nerve enlargement and hemihypertrophy of the brain stem were rare. Nerve growth factor (NGF), which is produced and released by brain cells, is involved in the regulation of choline acetyltransferase activity,11-13 which is highly expressed in regions of the central nervous system innervated by the magnocellular cholinergic neurons of the basal forebrain including the hippocampus, olfactory bulb, and neocortex. Antonelli et al14 demonstrated increased tissue levels of NGF and numerous high-affinity NGF-receptor-positive cells in hemimegalencephaly tissues compared with control brain tissues. Furthermore, not only neurons but also small blood vessels and nerve fibers displayed high-affinity NGF-receptor positivity. Our results can be explained by the findings of their study. Ipsilateral enlargement of olfactory nerves and cerebral vascular dilation may be due in part to increases in NGF and high-affinity NGF-receptor-positive cells, the interaction of which plays a crucial role in neuronal growth, differentiation, and promotion of repair. Only 1 previous article presented an MR image of ipsilateral olfactory nerve enlargement, though no comment was made regarding this except in a figure legend.15 To our knowledge, ours is the first study to clearly describe the cranial nerve and vascular abnormalities in hemimegalencephaly. A few case reports have described cerebellar and brain stem hypertrophy and cerebellar architectural alterations on the affected side in patients with hemimegalencephaly.9,10 However, no original manuscripts have evaluated brain stem and cerebellar abnormalities. We detected a moderately high incidence (46.7%) of ipsilateral cerebellar enlargement, a low incidence (6.7%) of brain stem hypertrophy, and a moderate incidence (30%) of abnormal cerebellar folia patterns. There are a few limitations to this study. Because it was a retrospective study, we evaluated only cranial nerves I, II, and V, which were constantly observed on routine MR studies. If we had used high-spatial-resolution sequences, such as 3D constructive interference in steady state (CISS), other smaller cranial nerves could have been examined.16,17 Furthermore, 3D CISS sequences can reveal not only the cranial nerves but also other fine structures existing in the subdural or subarachnoid spaces,18 and abnormal small vessels or fine membranes might have been detected in the ipsilateral subarachnoid space. Another limitation is that pathologic examination was not performed for abnormal structures occurring outside the involved hemisphere. Although 22 patients underwent surgery, the procedure was a functioning hemispherectomy, and unnecessary procedures were not performed. We have presented various morphologic abnormalities occurring outside the involved hemisphere, detected on MR imaging in 30 patients with hemimegalencephaly. Olfactory nerve enlargement and cerebral deep and superficial vascular dilations were often observed, though optic nerve enlargement was rare. 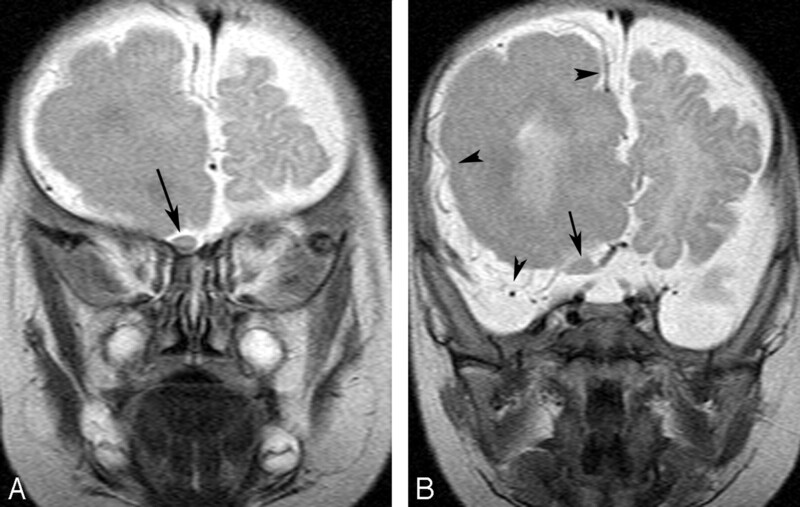 Hemicerebellar hypertrophy was observed in nearly half of the patients, and a small number of patients exhibited brain stem asymmetry. All of these findings were detected on the affected side, though abnormal cerebellar folia were noted on both sides. Accepted after revision June 18, 2006.